The Goderich Harbour is located at the mouth of the Maitland River, on the east shores of Lake Huron. The Harbour includes the Inner Harbour, generally all land and water east of the mine, and the Outer Harbour, which is bounded by the north and south breakwaters. 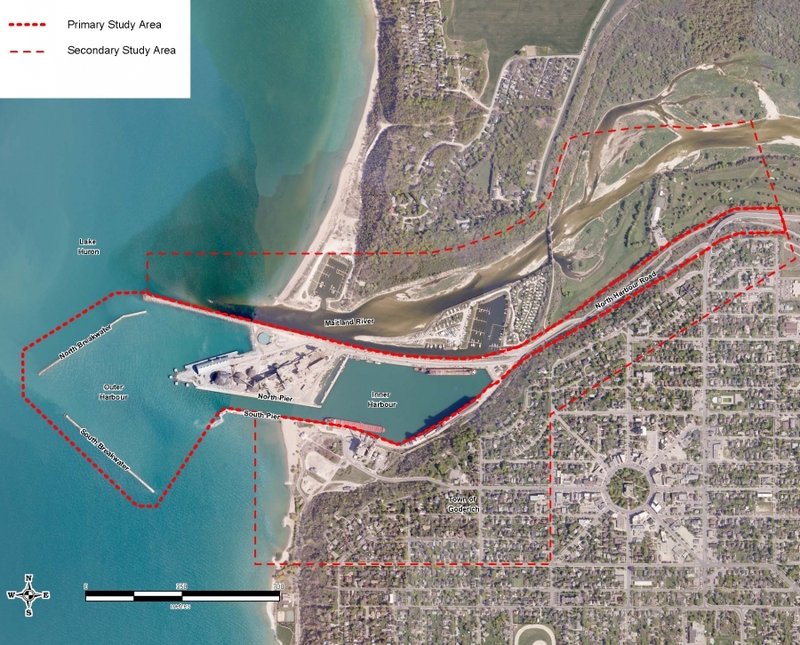 The Study Area for the Goderich Wharf Expansion Environmental Assessment includes a Primary and a Secondary study area. The Primary Study Area includes the Inner and Outer Harbour areas and North Harbour Road. Identified for expanded wharf facilities and road improvements, the Primary Study Area will be focused upon during the Environmental Assessment. The Secondary Study area includes the mouth of the Maitland River, the lower Maitland River valley, and lands adjacent to the Harbour. The Primary and Secondary study areas are shown in the image below.